A Curbed reader recently emailed requesting that we dig into our archives to pull up old discussions about the housing bubble to see what people were saying "back then" - you know, pre-housing/financial meltdown. We found two interesting posts from 2007: One from December 2007 that asked readers at what point they would look to buy a home (when prices dropped 0%, 10%, 20%, 30%, 40+% or never); and one post from February 2007 that reported on a study that found only 47% of those surveyed thought a housing bubble collapse was likely. Here's a quick look back at what was happening in the distant bubbly past. We see that in the February 2007 post many of you were very realistic in your belief that the market was overpriced and would inevitably crash. Signs of the slowdown were apparent and there was worry. By December 2007, 27.5% of voters said that housing prices would need to fall at least 30 percent before they thought about buying. There was doubt amongst some commenters that that sort of decline would actually take place. 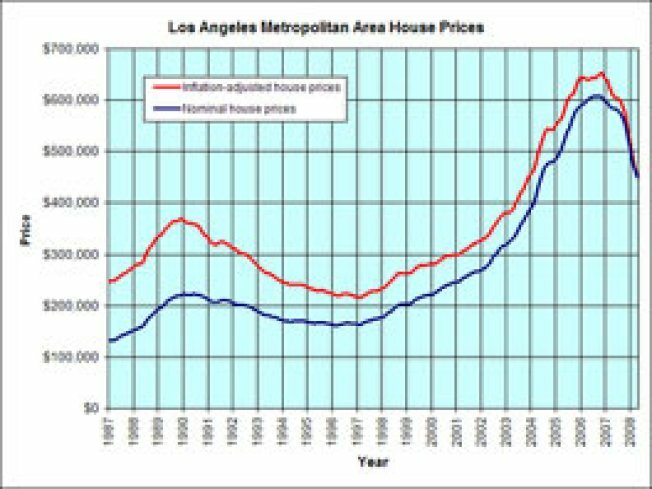 Then, pre-Curbed commenting, we see this post on a story from the LA Times in 2006telling readers not to hold their breath waiting for a bubble burst. Good times. 12/06/2007: "interesting. so far 3 votes for 30%...that's very wishful thinking for most (but not all) areas of LA. although sellers are still being stubborn as evidenced by the asking prices of new listings, 30% is still high. for example, i don't see a $1 million house dropping to $700K even over the course of the next year or two. or a $700K house down to $500K. 15-20% max is more realistic." 12/06/2007: One prescient reader said this: "I went for death before buying. It wasn't true, but I felt good clicking the button. On the serious side, I'll wait at least two years to see if my employer doesn't can me as our whole economy collapses, then go from there. If the country is totalling splitting at the seems, plus I'm unemployed, I might move somewhere in the EU"
2/02/2007: "2007 will be a telling year due to the unprecedented $$$ of resetting ARM, IO, and neg-am loans. I'm not one for doom and gloom, but I do think things have gotten out of whack in recent years, due largely to loose credit. The current set of circumstances has never existed in the past. No one can tell the future, but it is hard to deny there is cause for concern." 02/04/2007: "As much as people don't want to admit it, things ARE stalling now. I keep a very close watch on homes in my neighborhood and neighborhoods I would like to buy in, and I have seen more than a handful stay on the market for 6+ months. In the meantime, prices on these homes keep getting slashed. But it's never enough of a slash to bring on the buyers... so the homes come off the market, only to be relisted again (one just this past week after 6 months off the market) at about 20% less than was before. And still... no bites. Coincidence? i think not. People are finally coming around to the idea that the hysteria of the last 2-3 years was just that - hysteria."